Echo! Echo! Echo! 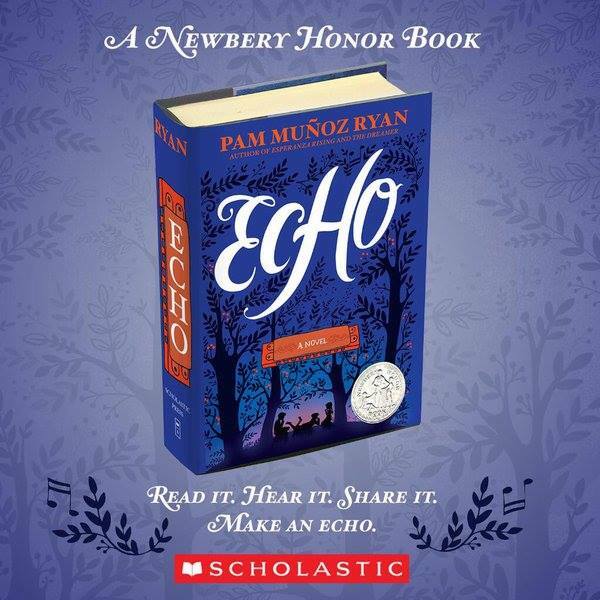 I've been randomly shouting out that word ever since Pam Muñoz Ryan's Echo was named a 2016 Newbery Honor book. Echo! Echo! Echo! It never gets old. Congratulations, Pam! Today is Pam Muñoz Ryan's turn to shine! Thank you, Pam! Mr. Schu: Everyone loves hearing about THE CALL. What ran through your head when the phone rang? What were you thinking about when the Newbery committee was cheering for you? Pam Muñoz Ryan: In previous years when I've been privileged to be notified about an ALA award, I was always called the night before so I thought that all the committees did the same. When I went to bed late Sunday night, knowing that Boston was three hours ahead, I presumed the decisions and calls were said and done. I didn't sleep well. No matter what anyone says, the disappointment creeps in on some level. I told myself all the right things. All the true things. That there are many well-loved books that have withstood the test of time which were never recognized. That there is no one award that defines me as a writer, or for lack thereof, diminishes me. That readership is the best award. That it's about the work, and I'm fortunate to continue to have work in a profession I love. My mind was rock solid. My heart, a little wobbly. Are all writers' hearts a little wobbly? When the phone rang at 3:00 a.m. and I saw the word Massachusetts on the Caller ID, I felt queasy. Wasn't it over? I answered the phone to hear Ernie Cox telling me that ECHO had received a Newbery Honor. The committee cheered. What beautiful music! What did I feel? I think it was disbelief mixed with joy. What did I say? I don't remember. I hadn't told any of my family it was the weekend of ALA. When my husband heard me answer the phone, he sat up in bed, worried, and said, "What? What is it?" I remember reassuring him, while on the phone with the committee, that it was a good middle-of-the-night phone call and not a dreaded one. 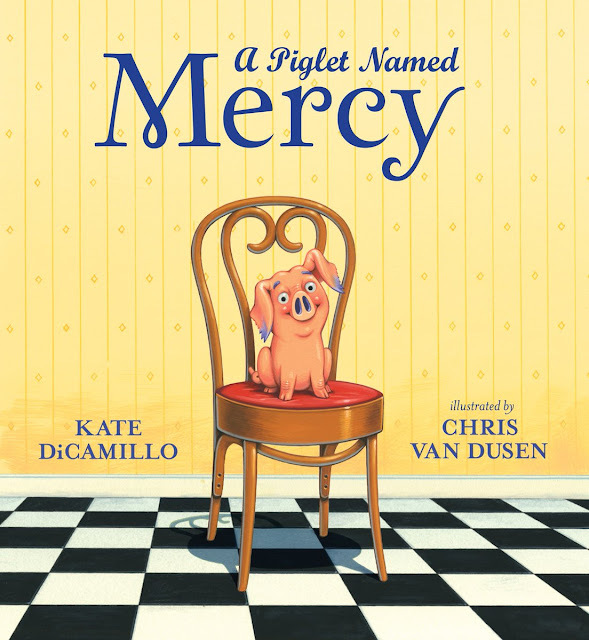 After I hung up, I called Lizette Serrano, head of library marketing at Scholastic, and my editor, Tracy Mack. Both calls were tearful love-fests. At this point it was around 4:00 but there was no going back to sleep and too early to call the rest of the family. At 5 a.m., I watched the announcements downstairs in my office, by myself, with a cup of coffee. Then, I started waking people! Everyone I was in contact with that day kept asking if I was drinking champagne. When I look back on it, I have to laugh. First, we didn't have any champagne. But, more than that, the rest of the day unfolded in such an ordinary way. Early, I had to follow my mom, who is 85 and lives with us, to Toyota to take her car in. For a few hours, I watched my granddaughter, who had a fever and was home from school. I worked because I had a deadline on a new novel for Tracy. That afternoon, I had an appointment for a mammogram and flu shot. And when I thought the day was winding down and I might savor the news with a glass of something, my son called to remind me that I'd agreed to meet with his boss's daughter, who wants to be a writer someday, and she was on her way over. Through it all, the sweet news kept popping into my brain. And all I felt was gratitude. That's how it's been every day since January 11th. Life moves forward. The everyday rules, until I remember the call and that ALA is on the horizon in June. Then I feel disbelief and joy all over again. It's now over a week later and I still haven't had champagne. But there's a bottle chilling in the fridge for when the family is all together. Pam Muñoz Ryan: It's a gift - to me and my editor, who worked hard at my side. It helps sustain the life of the book. It shines a light on a work that took almost six years to write and that I'm so proud to have written. It gives me the opportunity to bring my family to Orlando, go to The Wizarding World of Harry Potter, buy a new dress, toast with my Scholastic family and say thank you to fifteen people who I appreciate so much that I want to invite them all to Thanksgiving. It's a glorious gift. School libraries are safe havens, often for the student you least suspect. Borrow Echo from your school or public library. Whenever possible, please support independent bookshops. It's always great to hear how the winners respond! If I had to finish the sentence...School libraries are places to go to escape your everyday. This book is why I love reading! You get to know the characters and love them like they are your friends or family.School libraries are a place to discover, explore and be carried away by all the you can learn, read and imagine! Everybody belongs!